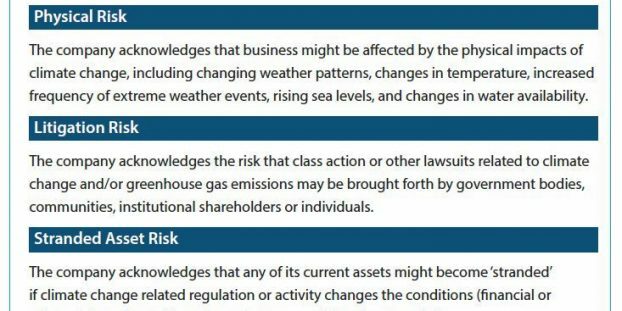 Following the historic majority votes on climate risk shareholder proposals in 2017, this panel discussion will explore evolving institutional investor viewpoints on climate risk and opportunity. The panelists will also examine how these changing perspectives and other shifts in the capital markets will sculpt investor expectations and engagements around climate risk disclosures and boardroom climate competency at portfolio companies in the 2018 proxy season. I may not have the numbers totally accurate, but the direction is clear. There was a sea-change in support for climate competency resolutions at high profile companies. The vote at Exxon-Mobil went from something like 36% in 2016 to 62% in 2017. At Occidental, it went from something like 49% in 2016 to 79% in 2017. The vote was large credited to BlackRock and Vanguard finally voting to address this growing risk. It was pointed out, change occurred not only on climate but other issues as well. For example, the Say-on-pay withhold at Southern went from something like 7% to 39%. Are we witnessing a revolution in how large mostly indexed funds will vote going forward? Maybe, but there was little change in voting at less visible companies. Let us hope this year was aimed at real change, not just positive publicity to help investors feel better. See Key Climate Vote Survey Provides Tool. Asset owners are updating their policies led by the New York City Comptroller, CalPERS, CalSTRS, and other public pensions. Now mainstream funds are beginning to see climate competency or risk as material. BlackRock is looking at risk. At the NYC Comptroller, about 1/3 of proxy access targets were chosen because of questionable climate competency. They wrote to 150 companies. 140 did proxy access without proposal. 11 with. Now they are seeking a matrix of board race, gender, etc. and are asking to engage on the board refreshment process. They are reviewing several mechanisms for investor input, wanting to ensure climate competency and diverse boards. Capital allocations are positioning for low carbon future. So far, initiatives have led to positive engagements. There was discussion around the recently released 5050climate.org Key Climate Vote Survey. Carbon foot printing is an imperfect assessment of risk. NYC Comptroller has engaged with many companies. Hear what the company says. Give them a chance to talk through. We want to be seen as constructive. We don’t want to tell companies to do something that they can’t. We are providing risk profiles on clients to them. At this point, there is no real competition yet between major funds for lowest carbon footprint and highest return. That could be coming. State Street put out its first paper on topic in early 2016. Their CEO sent out a letter that boards should consider sustainability. They took a deep dive into 50 companies around the globe to determine the role of investors. Is risk analysis robust and integrated into long term strategy? What is the board oversight? Does the company have GHG goals, carbon price disclosure (average and range), and can they articulate how their analysis impacts the allocation strategy? Reports go back to the investment analysts. Dave Jones has influence over the 1300 insurance companies operating in California. In 2009 the national association put out climate risk survey. We want insurance companies get positive returns on their investments so they can be solvent enough to pay claims. 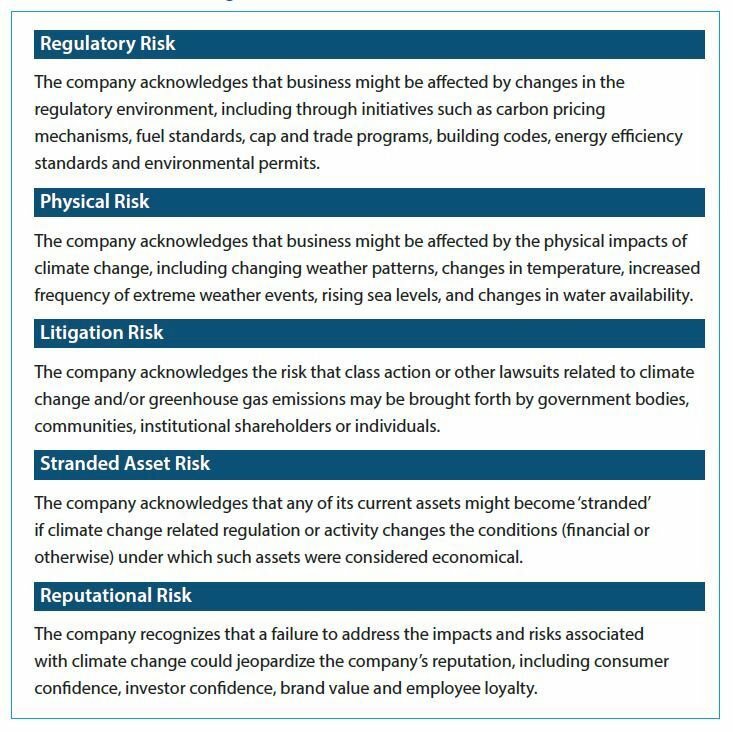 They found insurance companies were not paying adequate attention to risk in portfolio companies that directly rely on burning carbon. In 2016, part of their initiative was to get public disclosure of investments in high carbon companies through a mandatory survey. Particular concerns are with coal as many of those companies have started going broke. Jones became convinced that most thermal coal would be stranded assets. He has asked insurance firms to stop such investments. However, there is no mandate, other than to report. They also looked at companies putting too many eggs in one basket – like investing in specific geographic areas but also having heavy insurance concentrations in same areas. His office is sharing best practice with insurance regulators around the world. Washington State is also doing quite a bit in trying to get climate competency in all sectors of the economy by at least reporting GHG.